Her married name was Parsonage. Lillian Dean was born on 8 June 1907 at, Bolton, Lancashire, . She married Eric Parsonage, son of Herbert Harold Parsonage and Esther Ann Morris, on 31 March 1934 at, Bolton, Lancashire, . Lillian Dean worked as a weaver. She died on 28 July 1992 at Fleetwood, Lancashire, at age 85. Nita Parsonage is a Chief Nursing Officer. Her married name was Brookes. She was born on 23 June 1940 at Blackpool, Lancashire. She married Robert Leslie Brookes, son of Robert Brookes and Hilda Walton, on 20 November 1965 at Blackpool, Lancashire. Nita Parsonage and Robert Leslie Brookes were divorced in 1977. Robert Leslie Brookes was born on 25 February 1940 at Barnsley, Yorkshire. He married Nita Parsonage, daughter of Eric Parsonage and Lillian Dean, on 20 November 1965 at Blackpool, Lancashire. Robert Leslie Brookes and Nita Parsonage were divorced in 1977. It is beleived that he died as an infant - no other details are known. Geoffrey Parsonage was born. Emily Hazel Parsonage was born on 1987 at Nottingham, Nottinghamshire. She was baptised on 10 April 1988 at The Church of the Nativity of Our Lady, Ardee, County Louth, Eire. William Martin Parsonage was born on 1990 at Nottingham, Nottinghamshire. As of 1990, William Martin Parsonage also went by the name of Liam. He was baptised on 15 December 1990 at The Church of the Nativity of Our Lady, Ardee, County Louth, Eire. Henry Tomàs Parsonage was born 1992 at Nottingham, Nottinghamshire. As of 1992, Henry Tomàs Parsonage also went by the name of Harry. He was baptised on 11 October 1992 at The Church of the Nativity of Our Lady, Ardee, County Louth, Eire. Her married name was Eaton Shore. 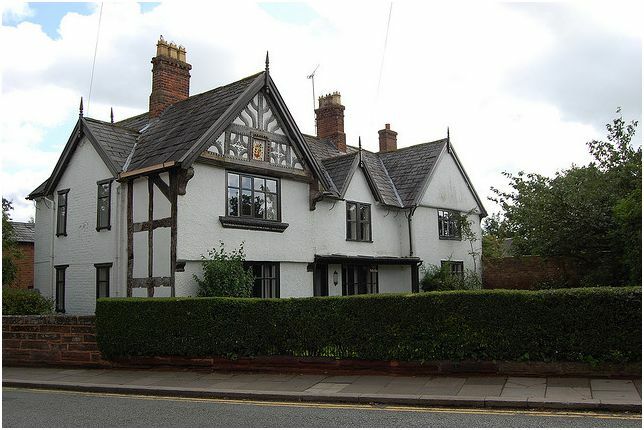 Emma Louisa Parsonage was born in 1854 at Broxton, Cheshire. She appeared on the 1861 Census in Broxton, Cheshire, and Thomas Parsonage, Frances Elizabeth Blake, Thomas Henry Caldecott Parsonage, Ellen Rose Parsonage and Eliza Eugenia Parsonage were living in the same household; The head of the household, Thomas (senior), described himself as a farmer of 20 acres. Also living with the family was Ann Bowker, aged 16 years a house servant. Emma Louisa Parsonage appeared on the 1871 Census in Mount Pleasant, Broxton, Cheshire, and Thomas Parsonage, Frances Emily Parsonage, Mary Elizabeth Parsonage, Frederick John Parsonage and Frances Elizabeth Blake were living in the same household; The head of the household, Thomas, described himself as farmer of 18 acres. 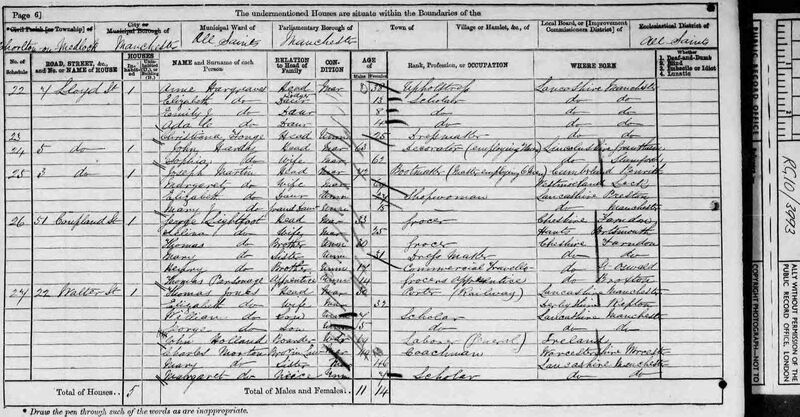 Emma Louisa Parsonage appeared on the 1881 Census in Spurstow, Cheshire; She was living as an unmarried servant in the household of David Bird and gave her occupation as a cheesemaker. Emma Louisa Parsonage married George Eaton Shore in 1882 at, Cheshire, . 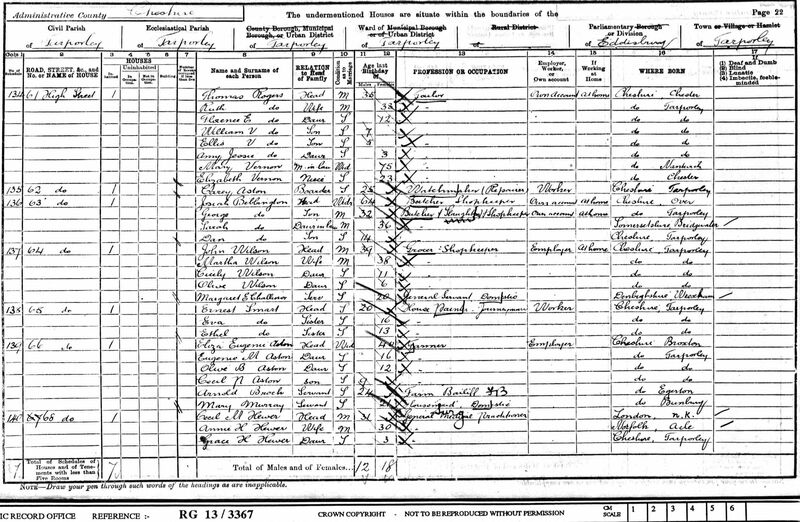 Emma Louisa Parsonage appeared on the 1891 Census in, Crewe, Cheshire, , and George Eaton Shore, Elizabeth Mary Louisa Eaton Shore, John James Eaton Shore, William Eaton Shore, Richard Eaton Shore and Mary Elizabeth Parsonage were living in the same household; George was the Borough Surveyor and Mary Parsonage his sister in law was a visitor. 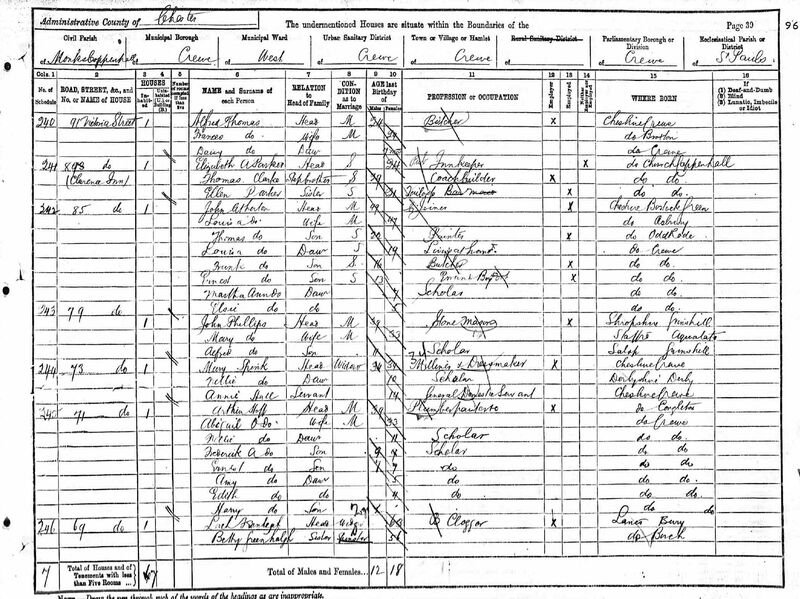 Emma Louisa Parsonage appeared on the 1911 Census in, Crewe, Cheshire, , and George Eaton Shore, Elizabeth Mary Louisa Eaton Shore and John James Eaton Shore were living in the same household; George was the Borough Surveyor of Crewe and his son John was the Assistant Surveyor. Elizabeth Reeves a servant lived with teh family. Marriage* Emma Louisa Parsonage married George Eaton Shore in 1882 at, Cheshire, . Thomas Henry Caldecott Parsonage was born in 1856 at Broxton, Cheshire. 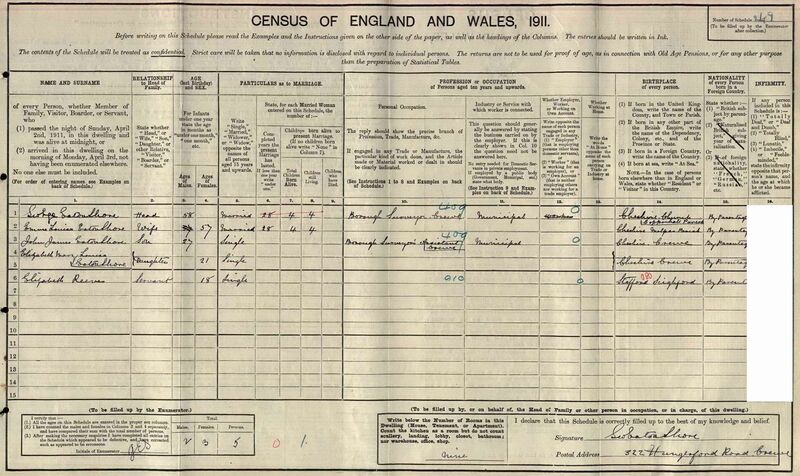 He appeared on the 1861 Census in Broxton, Cheshire, and Thomas Parsonage, Frances Elizabeth Blake, Emma Louisa Parsonage, Ellen Rose Parsonage and Eliza Eugenia Parsonage were living in the same household; The head of the household, Thomas (senior), described himself as a farmer of 20 acres. Also living with the family was Ann Bowker, aged 16 years a house servant. Thomas Henry Caldecott Parsonage appeared on the 1871 Census in, Manchester, Lancashire, ; Thomas was living with a family named Lighfoot whose head George was described as a Grocer. Thomas was described as an apprentice to George. Thomas Henry Caldecott Parsonage married Mary A. Beck in 1879 at Christ Church, Crewe, Cheshire. Thomas Henry Caldecott Parsonage appeared on the 1881 Census in 8 Higham View, Pendleton in Salford, Lancashire, and Mary A. Beck and Alexander Beck Parsonage were living in the same household; The head of the household, Thomas H. gave his occupation as a grocer's assistant. 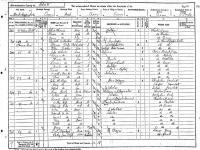 Thomas Henry Caldecott Parsonage appeared on the 1891 Census in, Nantwich, Cheshire, , and Mary A. Beck, Alexander Beck Parsonage and Fred Waldensian Parsonage were living in the same household; Thomas was described as a Grocer's Assistant. Thomas Henry Caldecott Parsonage appeared on the 1901 Census in 24 Ridgway Street, Monks Coppenhall, Crewe, Cheshire, and Mary A. Beck, Alexander Beck Parsonage, Thomas H Parsonage and Fred Waldensian Parsonage were living in the same household; Thomas, and his sons Alexander and Thomas where all described as Grocer's Assistants. Thomas Henry Caldecott Parsonage died circa December 1908 at, Cheshire, . Marriage* He married Mary A. Beck in 1879 at Christ Church, Crewe, Cheshire. Ellen Rose Parsonage was born circa 1857 at Broxton, Cheshire. 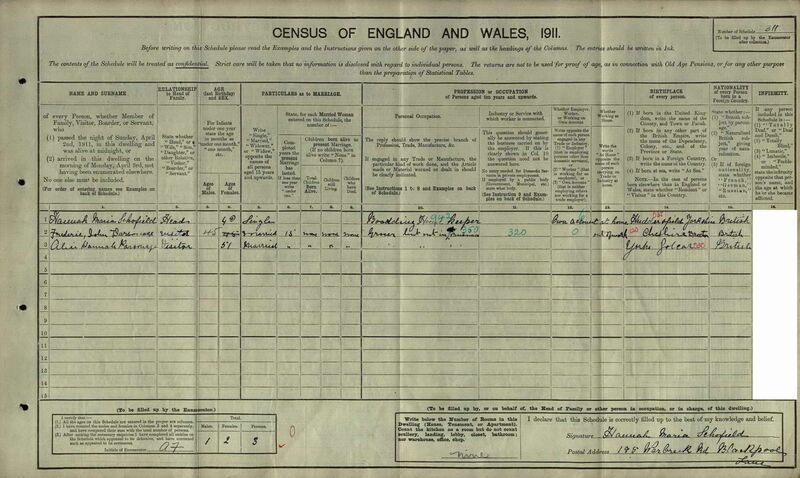 She appeared on the 1861 Census in Broxton, Cheshire, and Thomas Parsonage, Frances Elizabeth Blake, Emma Louisa Parsonage, Thomas Henry Caldecott Parsonage and Eliza Eugenia Parsonage were living in the same household; The head of the household, Thomas (senior), described himself as a farmer of 20 acres. Also living with the family was Ann Bowker, aged 16 years a house servant. Ellen Rose Parsonage appeared on the 1871 Census in Ivy Cottage, Broxton, Cheshire, and Eliza Eugenia Parsonage, Henry Caldicott and Elizabeth (?) were living in the same household; The head of the household, Henry Caldicott, described Elizabeth and Ellen as his grandaughters. It is not clear that Caldicott was really the children's grandfather. Their parents were living in Broxton at the time with their other children. 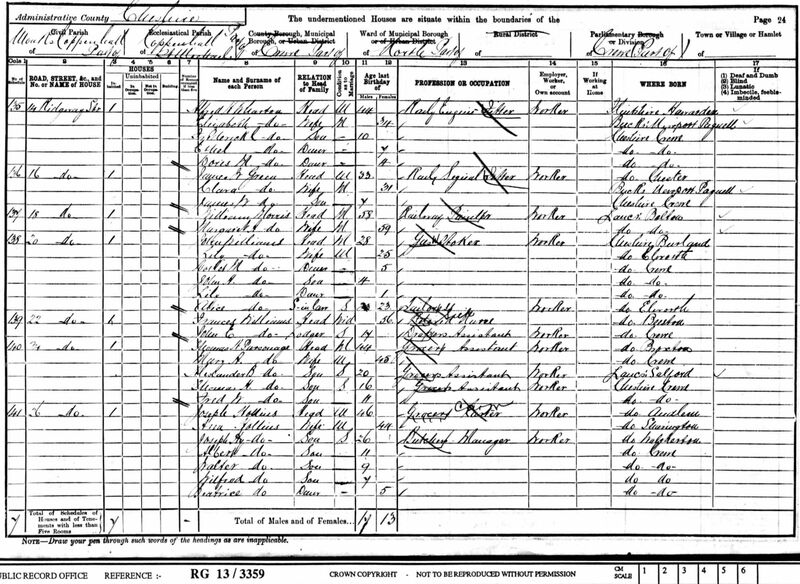 Ellen Rose Parsonage appeared on the 1881 Census in The Rectory, Higham on the Hill, Leicestershire; Ellen was recorded as Helen R. and was living in the house of Henry Fisher and his family. Ellen was described as a nurse (dom) and Henry Fisher was the rector of Higham. Interestingly there was only one other person in Leicestershire who gave their place of birth as Malpas. That person was a Thomas B. Lowe born 1855, a bank clerk who was a boarder with a family in Wigston. One wonders whether they may have been friends or was it just a coincidence. Eliza Eugenia Parsonage was born circa 1860 at Broxton, Cheshire. She appeared on the 1861 Census in Broxton, Cheshire, and Thomas Parsonage, Frances Elizabeth Blake, Emma Louisa Parsonage, Thomas Henry Caldecott Parsonage and Ellen Rose Parsonage were living in the same household; The head of the household, Thomas (senior), described himself as a farmer of 20 acres. Also living with the family was Ann Bowker, aged 16 years a house servant. 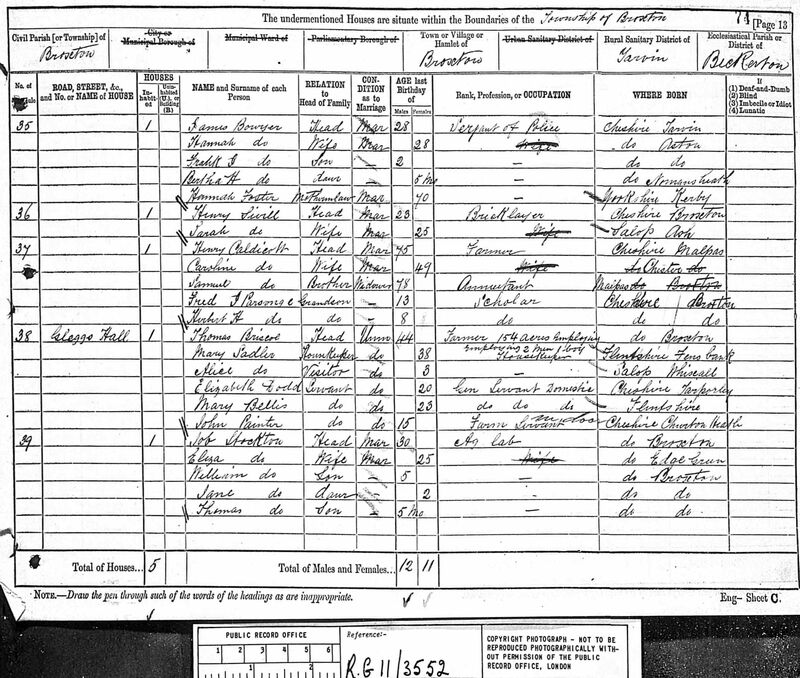 Eliza Eugenia Parsonage appeared on the 1871 Census in Ivy Cottage, Broxton, Cheshire, and Ellen Rose Parsonage, Henry Caldicott and Elizabeth (?) were living in the same household; The head of the household, Henry Caldicott, described Elizabeth and Ellen as his grandaughters. It is not clear that Caldicott was really the children's grandfather. Their parents were living in Broxton at the time with their other children. 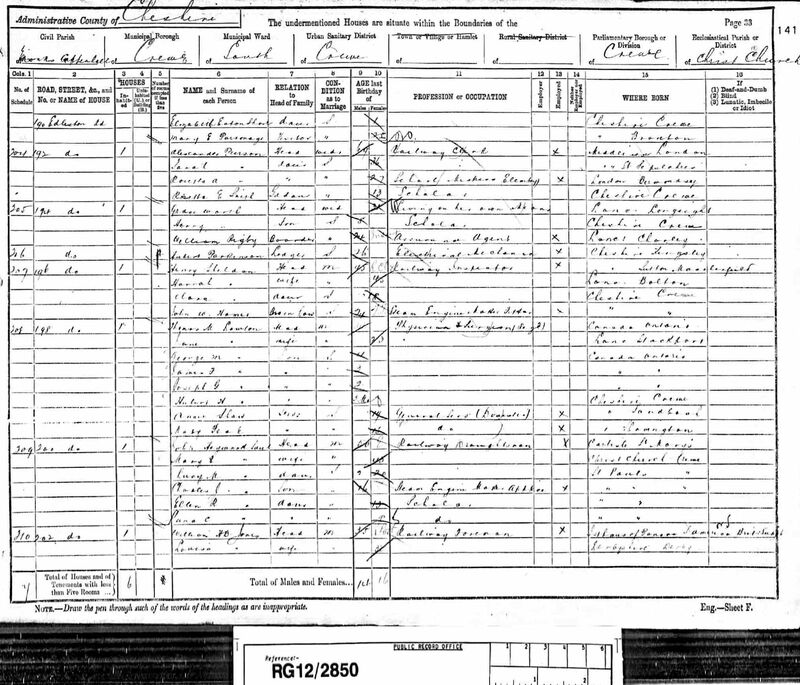 Eliza Eugenia Parsonage appeared on the 1881 Census in, Cheshire, , and William Aston were living in the same household; William Aston was the head, a farmer of 113 acres. His wife was named Jane Kirkham Aston and their children Robert J, William Carey, Claude H. Also on the famr were two servants and a dairy maid who was Eugenie Parsonage. As of after September 1883,her married name was Aston. 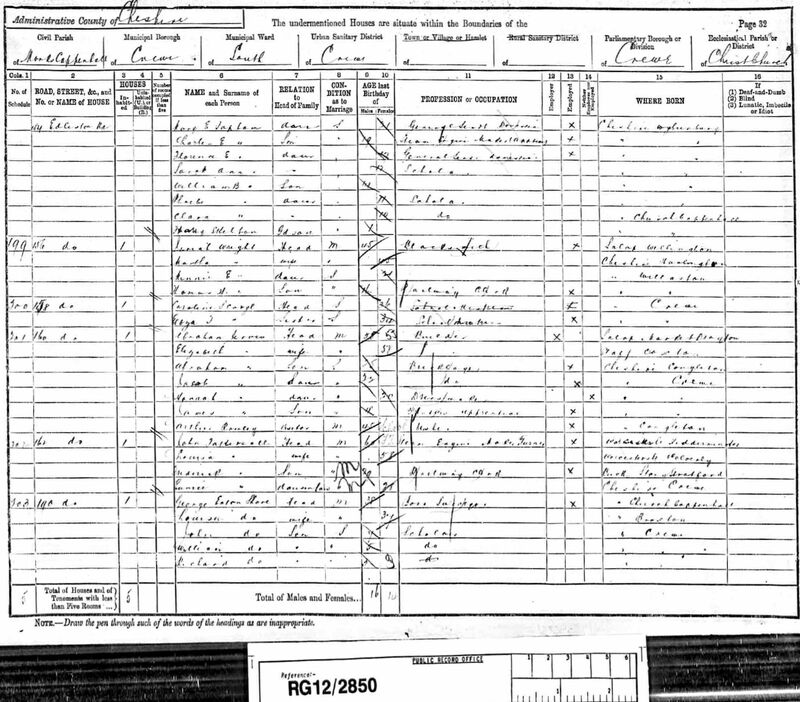 Eliza Eugenia Parsonage married William Aston after September 1883 at, Cheshire, . 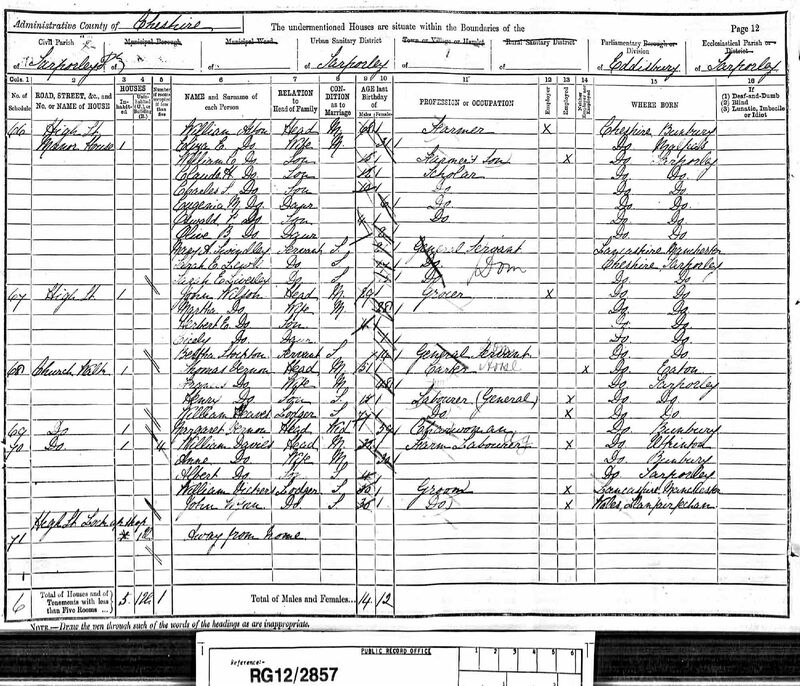 Eliza Eugenia Aston appeared on the 1891 Census in, Cheshire, , and Oswald Parsonage Aston, Olive Blanche Aston, William Aston and Eugenia May Aston were living in the same household; William Aston was the head, a farmer. He was now married to Eliza who had been his dairy maid 10 years earlier. They had three children Eugenia, Oswald and Olive. Also present was Claude Havelock, Charles Spurgeon and William Carey, the children from William's earlier marriage. 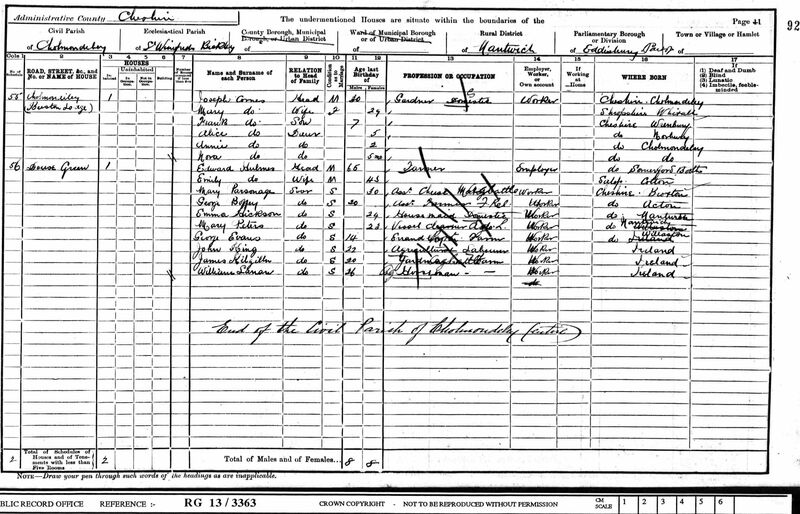 Eliza Eugenia Parsonage appeared on the 1901 Census in, Cheshire, , and Eugenia May Aston, Olive Blanche Aston and Cecil Percy Aston were living in the same household; Eliza was now a widow and still farming with her three children. 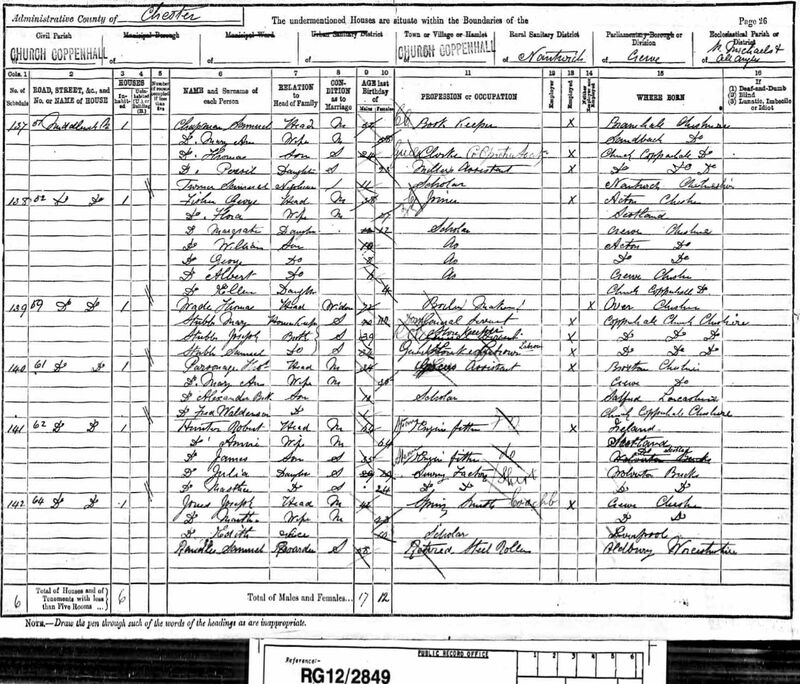 Eliza Eugenia Parsonage appeared on the 1911 Census in, Cheshire, , and Oswald Parsonage Aston, Olive Blanche Aston and Cecil Percy Aston were living in the same household; Eliza was a farmer and her three children were working on the farm. They had a visitor Caroline Penlington aged 74 and a servant Mary Lawson. Eliza Eugenia Parsonage died on 27 October 1932 at, Chester, Cheshire, ; Probate was to Cecil Percy Aston retired farmer in the sum £146. Marriage* She married William Aston after September 1883 at, Cheshire, . Her married name was Thomas. 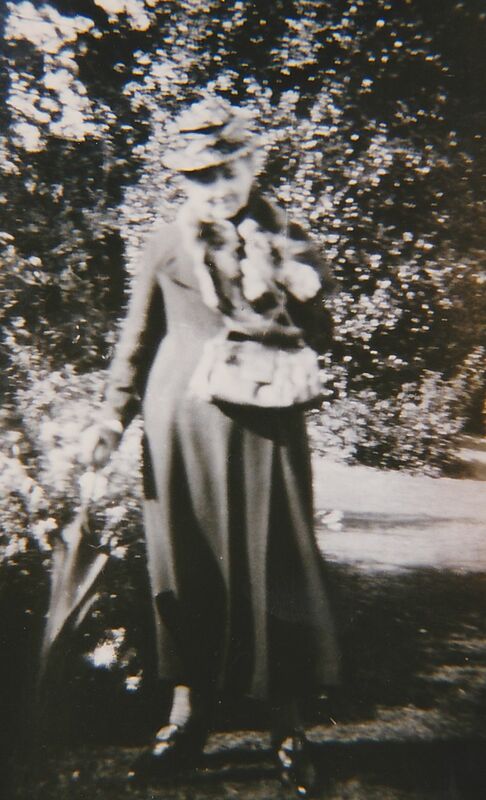 Frances Emily Parsonage was born circa 1861 at Broxton, Cheshire. She appeared on the 1871 Census in Mount Pleasant, Broxton, Cheshire, and Thomas Parsonage, Emma Louisa Parsonage, Mary Elizabeth Parsonage, Frederick John Parsonage and Frances Elizabeth Blake were living in the same household; The head of the household, Thomas, described himself as farmer of 18 acres. Frances Emily Parsonage appeared on the 1881 Census in 12 Hampshire Street, Cheetham, Lancashire; Frances was living in the household of John Pearce, a mercantile metal clerk. She was recorded as a general servant. Cheshire Marriage Index possible marriage Alfred THOMAS Coppenhall St Michael. Frances Emily Parsonage married Alfred Thomas before 1890. 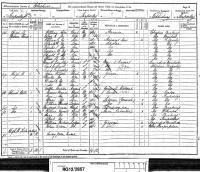 Frances Emily Parsonage appeared on the 1891 Census in, Crewe, Cheshire, , and Alfred Thomas and Daisy Blake Thomas were living in the same household; Alfred was a butcher. 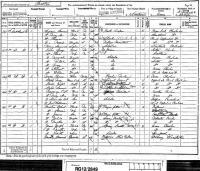 Frances Emily Parsonage appeared on the 1911 Census in, Crewe, Cheshire, , and Alfred Thomas and Daisy Blake Thomas were living in the same household; Alfred was a butcher. Marriage* Frances Emily Parsonage married Alfred Thomas before 1890. Mary Elizabeth Parsonage was born circa 1865 at Broxton, Cheshire. She appeared on the 1871 Census in Mount Pleasant, Broxton, Cheshire, and Thomas Parsonage, Emma Louisa Parsonage, Frances Emily Parsonage, Frederick John Parsonage and Frances Elizabeth Blake were living in the same household; The head of the household, Thomas, described himself as farmer of 18 acres. 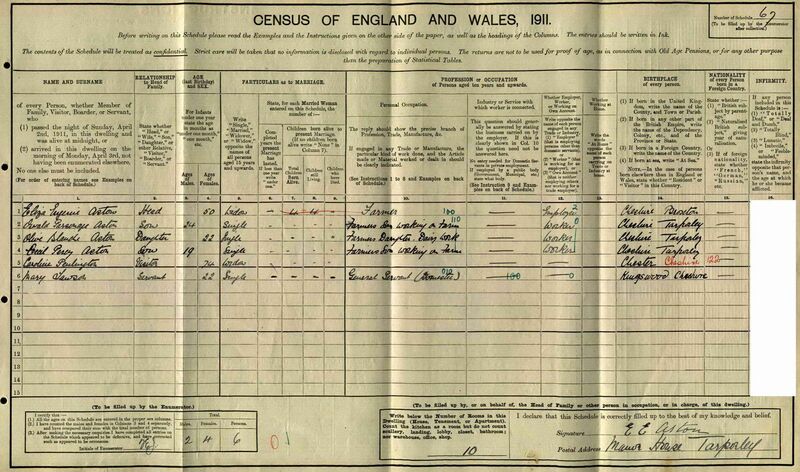 Mary Elizabeth Parsonage appeared on the 1881 Census in Broxton, Cheshire; Mary was living in the household of a William Faulkner who described himself as a farmer of 229 acres. Mary was a servant in the household and was described as a nurse. Mary Elizabeth Parsonage appeared on the 1891 Census in, Crewe, Cheshire, , and George Eaton Shore, Elizabeth Mary Louisa Eaton Shore, John James Eaton Shore, William Eaton Shore, Richard Eaton Shore and Emma Louisa Parsonage were living in the same household; George was the Borough Surveyor and Mary Parsonage his sister in law was a visitor. 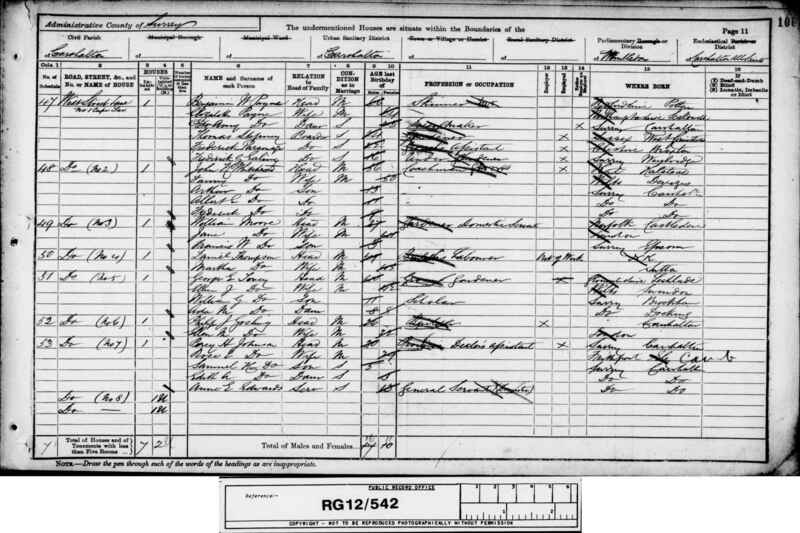 Mary Elizabeth Parsonage appeared on the 1901 Census in, Cheshire, ; Mary was living on the farm of Edward Hulmes and working as an assistant cheese maker. According to the Byrnes' children, Aunty Polly as she was known, first went to live with the Byrne family in 1921. At this time the Byrnes farmed at Pen-y-Felin Farm, Nannerch. In 1929 they moved to Siamber Wen Farm, Cilcain where she stayed with them, except for a short holiday with her brother Herbert who lived in Prestatyn. The Byrne family were very fond of her and respected her all the years she was with them. She helped Mrs. Byrne to bring up a family of eight children, who thought the world of her. Bill Parsonage (#2) used to refer to an Aunt Polly who lived on a farm at Loggerheads near Mold, this must be Mary. He visited there and used to go out with his "cousins" collecting mushrooms. Barbara (#178) says Polly used to work on a farm near Mold called Siamber Wen. The family she worked for there were Ralph and Nance Byrnes. The farm was a long walk from a railway station called Star Crossing Keys. Polly spent her last years with her brother Herbert and wife as she had bad arthritis. The Byrnes were apparently very fond of her and she brought up their children. The farm appears to have been a place to visit as Barbara's mother used to visit there with Pat and Betty (Barbara's sisters) and David Parsonage used to visit with his father. The address of the farm is Siamber Wen, Star Crossing Road, Cilcain, Mold CH7 5NU. Mary Elizabeth Parsonage died on 14 September 1950; She is buried in the same grave as Ralph and Nance Byrne in Cilcain cemetary. Frederick John Parsonage was born circa 1868 at Broxton, Cheshire. He appeared on the 1871 Census in Mount Pleasant, Broxton, Cheshire, and Thomas Parsonage, Emma Louisa Parsonage, Frances Emily Parsonage, Mary Elizabeth Parsonage and Frances Elizabeth Blake were living in the same household; The head of the household, Thomas, described himself as farmer of 18 acres. 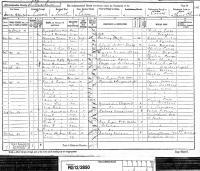 Frederick John Parsonage appeared on the 1881 Census in Broxton, Cheshire, and Henry Caldicott, Caroline (? ), Samuel Caldicott and Herbert Harold Parsonage were living in the same household; Henry Caldicott was a farmer, aged 75 years at the time, Caroline was his wife and Samuel was his brother. Henry Caldicott described Herbert and Frederick as his grandsons, although this is not likely to be strictly correct. 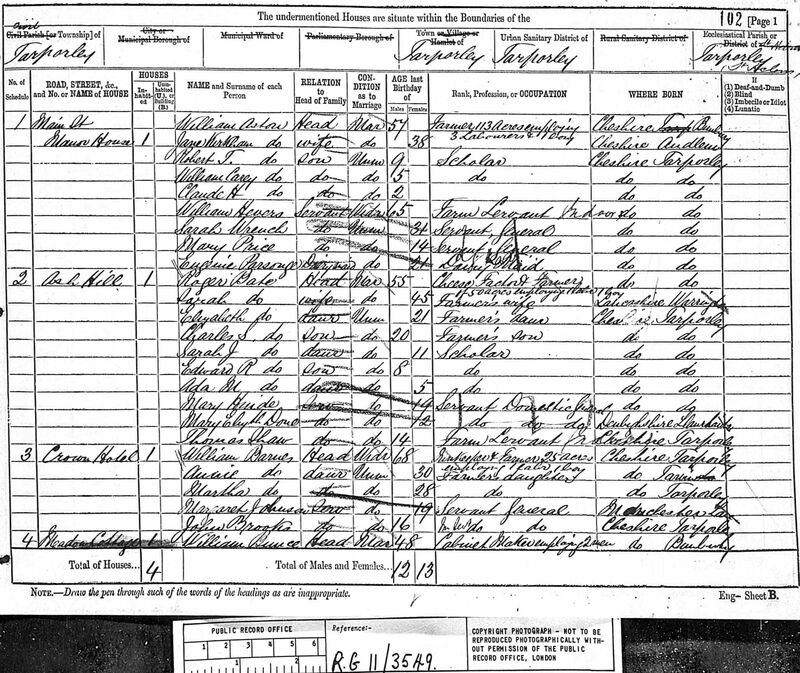 It appears that the boys' mother had died in 1875 and their father was living alone in Yorkshire. Frederick John Parsonage appeared on the 1891 Census in, Surrey, ; Frederick was a boarder with the family of Benjamin Payne and was decribed as single and a Grocer's Assistant. 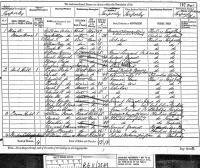 Frederick John Parsonage married Alice Hannah Hirst in May 1896 at, Blackpool, Lancashire, . 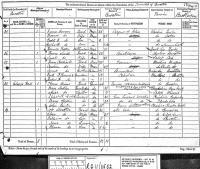 Frederick John Parsonage appeared on the 1901 Census in 23 Peter Street, Blackpool, Lancashire, and Alice Hannah Hirst were living in the same household; Frederick was described as a shopkeeper (grocery & provisions). 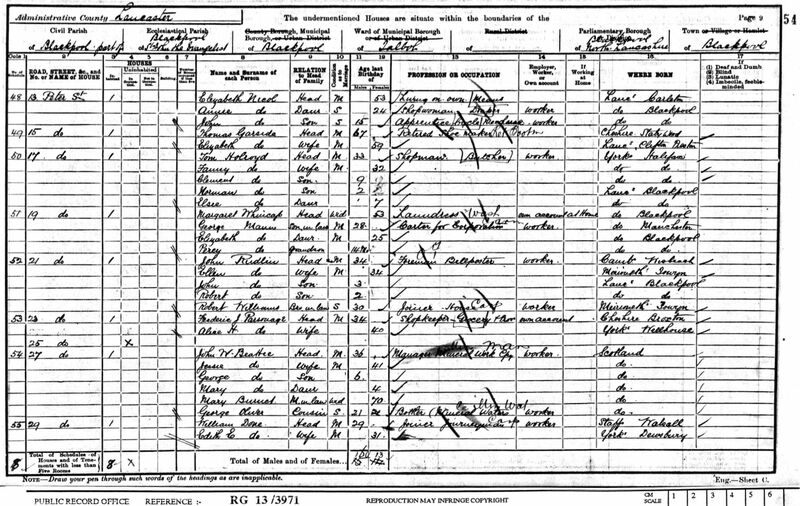 Frederick John Parsonage appeared on the 1911 Census in, Blackpool, Lancashire, , and Alice Hannah Hirst were living in the same household; Frederick and Hannah were visitors at the home of Hannah Maria Schofield, a Boarding House Keeper. Frederick was described as a Grocer not in business, and out of work. Frederick and Hannah were recorded as having had no children. Frederick John Parsonage died in November 1934 at, Blackpool, Lancashire, . Marriage* He married Alice Hannah Hirst in May 1896 at, Blackpool, Lancashire, . 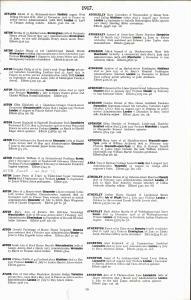 According to Barbara (#178) Ada married someone called Rodgers and lived in Fairburn St, Horwich. In a letter to the author a Mrs. Winstanley of Horwich wrote that Ada was her godmother. She says that Ada was good at making herbal medicines and ointments. They had a son and daughter and Ada's father lived with them. Ada's husband and son worked at the loco sheds. Ada showed Mrs. Winstanley's mother a photograph of a foreign looking family, the children beautifully dressed, they and their father looked foreign but the wife didn't. She thought Ada referred to the woman by the christian name of Laurel. Her married name was Rogers. Ada Mary Morris was born on 1 July 1867 at Rockwood Terrace, Monks Coppenhall, Crewe, Cheshire. 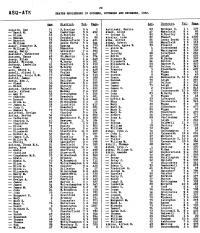 She appeared on the 1871 Census in, Crewe, Cheshire, , and Agnes Morris, Oliver Morris and Emily White were living in the same household; Oliver, the head, was described as foregman steel works, also present was wife Emily and daughters Ada and Agnes. Ada Mary Morris appeared on the 1881 Census in 26 Alton Street, Monks Coppenhall, Crewe, Cheshire, and Oliver Morris, Emily White, Agnes Morris, Arthur Morris, Oliver Morris, Clement Morris, Esther Ann Morris and William Henry Morris were living in the same household; The head of household, Oliver was described as a forgeman (iron), and Emily was described as a British Subject born East Indies. Ada Mary Morris married (?) Rogers. Ada Mary Morris died between 1939 and 1945 at, Crewe, Cheshire, . Marriage* She married (?) Rogers. 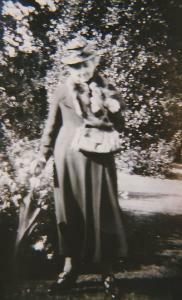 Agnes Morris was born on 15 October 1868 at Rockwood Terrace, Monks Coppenhall, Crewe, Cheshire. 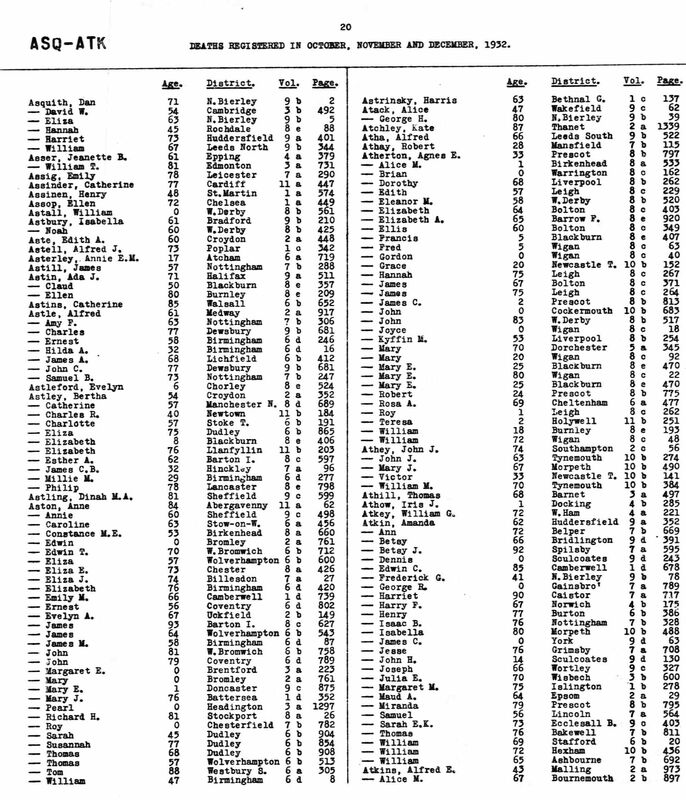 She appeared on the 1871 Census in, Crewe, Cheshire, , and Ada Mary Morris, Oliver Morris and Emily White were living in the same household; Oliver, the head, was described as foregman steel works, also present was wife Emily and daughters Ada and Agnes. Agnes Morris appeared on the 1881 Census in 26 Alton Street, Monks Coppenhall, Crewe, Cheshire, and Oliver Morris, Emily White, Ada Mary Morris, Arthur Morris, Oliver Morris, Clement Morris, Esther Ann Morris and William Henry Morris were living in the same household; The head of household, Oliver was described as a forgeman (iron), and Emily was described as a British Subject born East Indies. Arthur Morris was born on 8 June 1871 at 26 Rockwood Terrace, Monks Coppenhall, Crewe, Cheshire. He appeared on the 1881 Census in 26 Alton Street, Monks Coppenhall, Crewe, Cheshire, and Oliver Morris, Emily White, Ada Mary Morris, Agnes Morris, Oliver Morris, Clement Morris, Esther Ann Morris and William Henry Morris were living in the same household; The head of household, Oliver was described as a forgeman (iron), and Emily was described as a British Subject born East Indies. Arthur Morris appeared on the 1891 Census in 192 Chorley New Road, Horwich, Bolton, Lancashire, and Oliver Morris, Emily White, Oliver Morris, Clement Morris, Esther Ann Morris and William Henry Morris were living in the same household; The head of household, Oliver was described as a forge foreman. Arthur, Oliver and Clement were also described as forgemen. Also lodging in the household was another forgeman, Joseph Webb aged 16 years. Arthur joined the police force in 1892. 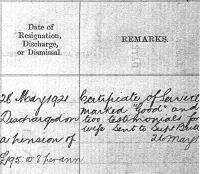 The records of Arthur's service in the Cheshire Constabulary are held at the Cheshire Record Office. 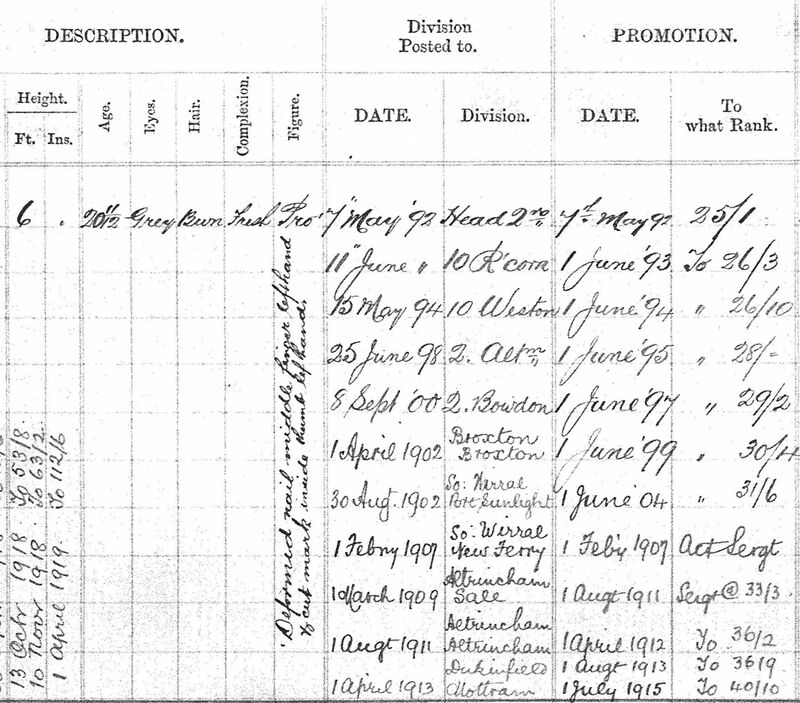 The enrolment book shows his police number was 356 and he joined the force on 7th May 1892. He stated his place of birth as Church Coppenhall, Crewe, and his occupation as labourer. Religion 'P', country 'E', height 6', age 20 11/12, eyes grey, hair brown, compl fresh, figure prop, he had a deformed nail middle finger left hand and cut mark inside thumb left hand. 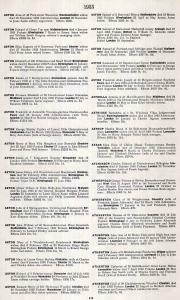 His record of postings shows he moved 10 times from joining to retiring in 1921. He worked at Runcorn, Weston, Altrincham, Bowdon, Broxton, Port Sunlight, New Ferry, and finally Dukinfield. He reached the rank of sergeant before he retired. 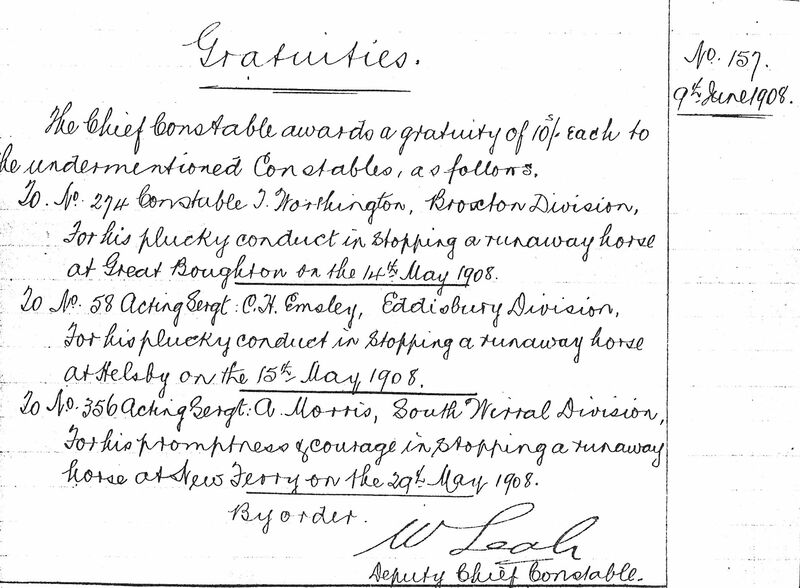 The record shows Good Conduct - at South Wirral Div, 29 May 1908, for his promptness and courage in stopping a runaway horse at New Ferry. Awarded a gratuity of 10s by the Chief Constable. At Dukinfield Div 13 Oct 1918 For long service and good conduct. Awarded merit badge and pay of 2d per idem. 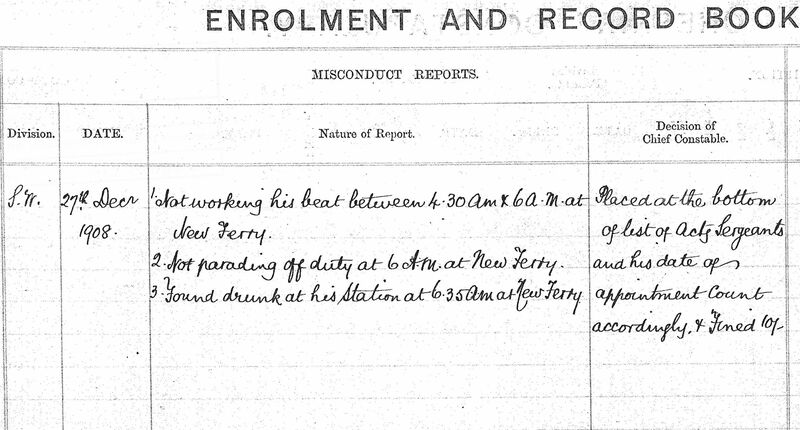 Misconduct - at South Wirral Div, 27 Dec 1908, 1) Not working his beat between 4.30 am and 6am at New Ferry. 2) Not parading off duty at 6am at New Ferry. 3) Found drunk at his station at 6.35am at New Ferry. Chief Constable's decision - placed at bottom of list of acting sergeants and his date of appointment count, and fined 10s. He was perhaps celebrating his wedding anniversary. 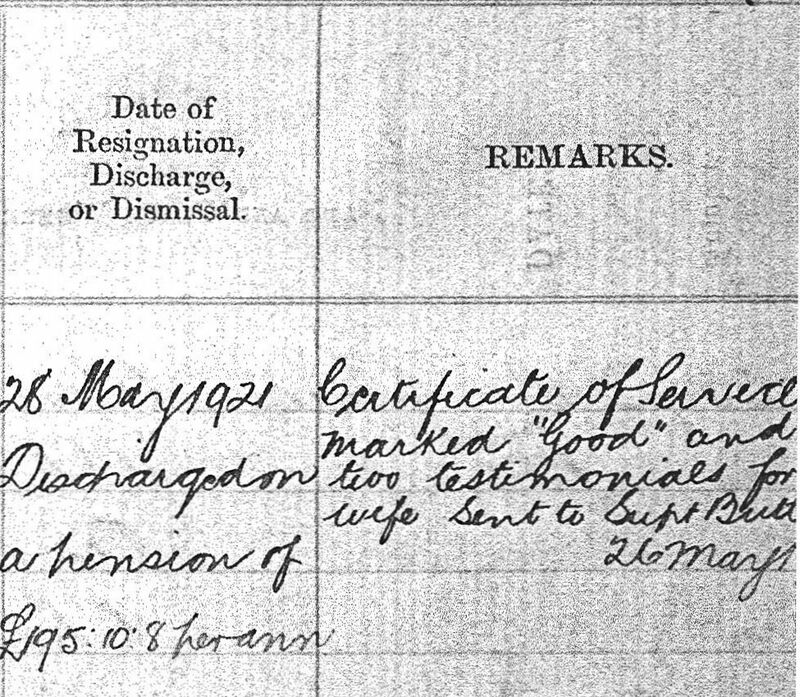 He was discharged on a pension of £195 10s 8d on 28 May 1921. The pensions register shows his annual pay at retirement as £293 10s 1d. It also shows he died 10 March 1952. At that time the police had to ask permission to marry and Arthur was granted permission on 30 Nov 1892 for his marriage on 26 Dec that year. The full details of his marriage are subsequently entered in the record. Arthur Morris married Eliza Webb, daughter of Joseph Webb and Eliza (? ), on 26 December 1892 at Parish Church, Astbury, Cheshire. Arthur Morris died on 10 March 1952 at age 80. Oliver Morris was born circa 1873 at, Crewe, Cheshire, . He appeared on the 1881 Census in 26 Alton Street, Monks Coppenhall, Crewe, Cheshire, and Oliver Morris, Emily White, Ada Mary Morris, Agnes Morris, Arthur Morris, Clement Morris, Esther Ann Morris and William Henry Morris were living in the same household; The head of household, Oliver was described as a forgeman (iron), and Emily was described as a British Subject born East Indies. Oliver Morris appeared on the 1891 Census in 192 Chorley New Road, Horwich, Bolton, Lancashire, and Oliver Morris, Emily White, Arthur Morris, Clement Morris, Esther Ann Morris and William Henry Morris were living in the same household; The head of household, Oliver was described as a forge foreman. Arthur, Oliver and Clement were also described as forgemen. Also lodging in the household was another forgeman, Joseph Webb aged 16 years. 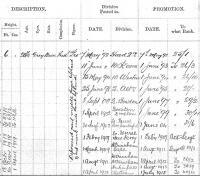 There is a staff record card that relates to an Oliver Morris entering work at the Horwich locomotive works in 1890 at 19 years of age this may be this Oliver but the age is out by one year from the 1891 census. Clement Morris was born circa 1874 at, Crewe, Cheshire, . He appeared on the 1881 Census in 26 Alton Street, Monks Coppenhall, Crewe, Cheshire, and Oliver Morris, Emily White, Ada Mary Morris, Agnes Morris, Arthur Morris, Oliver Morris, Esther Ann Morris and William Henry Morris were living in the same household; The head of household, Oliver was described as a forgeman (iron), and Emily was described as a British Subject born East Indies. Clement Morris appeared on the 1891 Census in 192 Chorley New Road, Horwich, Bolton, Lancashire, and Oliver Morris, Emily White, Arthur Morris, Oliver Morris, Esther Ann Morris and William Henry Morris were living in the same household; The head of household, Oliver was described as a forge foreman. Arthur, Oliver and Clement were also described as forgemen. Also lodging in the household was another forgeman, Joseph Webb aged 16 years. (Barbara#178) refers to a son of Oliver Morris called Clem who lived in Blackrod (near Horwich) perhaps this is Clem. Mrs Winstanley, goddaughter of Clement's sister Ada, states in a letter to the author that Clement had two children Clement? and Edna. Clement Morris married Fanny (?). 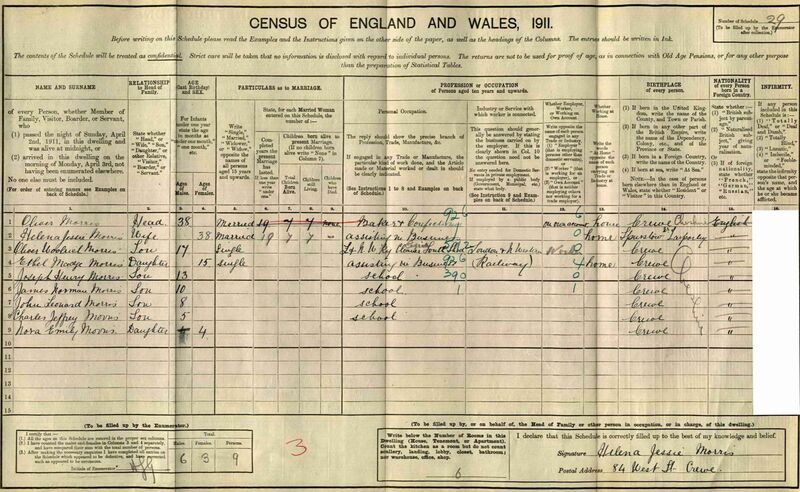 Clement Morris appeared on the 1901 Census in, Bolton, Lancashire, , and Oliver Morris, Fanny (? ), William Henry Morris, Mary Sale and Clement Morris were living in the same household; Oliver was described as Forge Foreman, Clement as Railway Guard and William as Steam Engine Maker - Fitter. Another grandson of Oliver was in the household - William 1 year born in Horwich but it is not clear who the parents are. William Henry Morris was born on 8 February 1880 at, Crewe, Cheshire, . He appeared on the 1881 Census in 26 Alton Street, Monks Coppenhall, Crewe, Cheshire, and Oliver Morris, Emily White, Ada Mary Morris, Agnes Morris, Arthur Morris, Oliver Morris, Clement Morris and Esther Ann Morris were living in the same household; The head of household, Oliver was described as a forgeman (iron), and Emily was described as a British Subject born East Indies. William Henry Morris appeared on the 1891 Census in 192 Chorley New Road, Horwich, Bolton, Lancashire, and Oliver Morris, Emily White, Arthur Morris, Oliver Morris, Clement Morris and Esther Ann Morris were living in the same household; The head of household, Oliver was described as a forge foreman. Arthur, Oliver and Clement were also described as forgemen. Also lodging in the household was another forgeman, Joseph Webb aged 16 years. 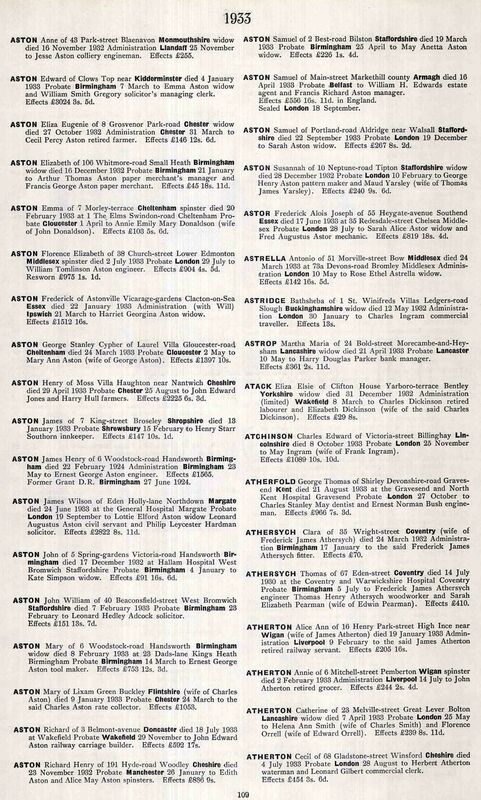 From the staff record cards of the Lancs and Yorks Railway held at the Manchester Record Office, William was an employee at the Horwich Locomotive Works like his father. It gives his date of birth as 8-2-80 and age on entering service at 14 years. He started work as a fitter in the Erecting Shop on May 20th 1895 at the rate of 35/- per week. He was still there in 1930 as a fitter in the fitting shop earning at the rate 46/-. Written on his card as a note is ' son of Oliver Morris late forge foreman '. There is also another card in the name William Henry Morris who was 28 in 1909 when he joined the service, he left in 1913. This person appears to be the right age for Olivers son but it is not clear if he is. 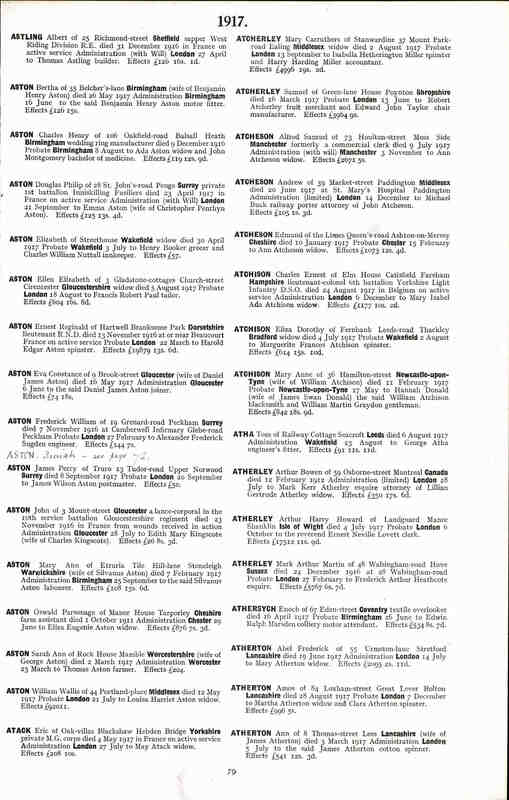 In local directories a William Morris is a fitter living at 62 Chorley New Road ( 1899-1901 ) and at 3 Hartley St ( 1907 & 1911 ). William Henry Morris married Mary Sale in September 1899. 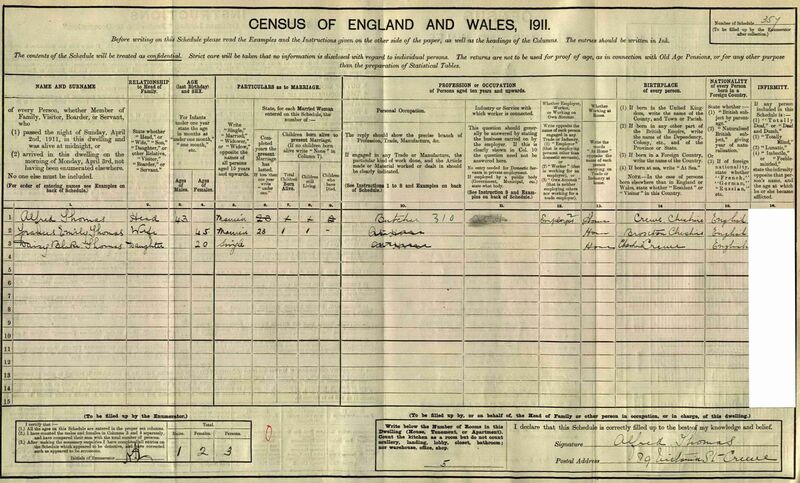 William Henry Morris appeared on the 1901 Census in, Bolton, Lancashire, , and Oliver Morris, Clement Morris, Fanny (? ), Mary Sale and Clement Morris were living in the same household; Oliver was described as Forge Foreman, Clement as Railway Guard and William as Steam Engine Maker - Fitter. Another grandson of Oliver was in the household - William 1 year born in Horwich but it is not clear who the parents are. William Henry Morris died circa 1936; Winifred his gt granddaughter believes he died unexpectedly after an operation on his stomach. The family grave is at Horwich Parish Church and was purchased by William on 9th July 1917. The address at the time of purchase was 9 Leicester Street. Marriage* He married Mary Sale in September 1899.